Quality products - the choice of professionals- available to you! Quality products - the choice of professionals - available to you. Personal care products are available from many sources, but the best quality products are those carried at professional establishments like ours. Don't be fooled by imitations and imposters. To ensure you receive a consistent, exceptional quality product, be sure to purchase your goods from authorized salon professionals. At Salon Barnes and Barnes, we sell only the highest quality hair, nail, skin and personal care products that meet our exacting standards. 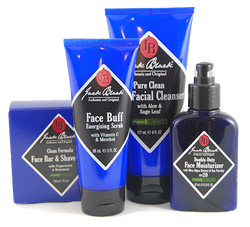 Salon Barnes and Barnes now features Jack Black products. Each product is carefully formulated from the very finest ingredients. Many, like plant extracts, herbs and healing botanicals come from time-tested natural remedies. They also incorporate the latest technologies to create formulas that are effective, lightweight and non-greasy. Fragrance-free, colorant-free, cruelty-free and dermatologist tested, Jack Black products take a refreshingly effective, honest and natural approach to helping you look and feel your best. Salon Barnes and Barnes is dedicated to offering only the highest quality products to our clients. We are a Goldwell Color Alliance Salon and Redken Authorized Retailer. We personally assure the quality and performance of all hair care products sold in our salon. Experience the difference by using the fine products we use everyday and make available for purchase by our clients. we can recommend just the right product to meet your needs.